I’ll have work at the grand opening of a new galley in Santa Fe, New Mexico, Hecho a Mano. New Work By: Mark Foster, Louis D'Amico, Allen Powell, Charles La Fond, Chris Casey, Linda Holland, Anne Englehardt, Margot Geist. Linda Holland's abstract paintings evoke realms, enigmatic, yet with palpable sense of place. Layered and blended colors, textures and motion invite the viewer to participate in a journey. Her abstract sculptures and paintings have been featured in solo and two-person shows in New Mexico as well as juried regional exhibits. In addition to corporate and private collections, her work has been selected for university, state and municipal art collections. Margot Geist, states, "Late summer, early fall...and the Farmers' Markets in our city offer panoplies of vegetables that delight the eye as much as the palate. We turn a corner and chance upon an aliveness that nourishes body and mind, if we remain open to kaleidoscopic space. The work here part of a larger series, might be imagined as an invitation to dance with elements, atop fields' brown-wet earth, in the rainbow light of a market mandala." 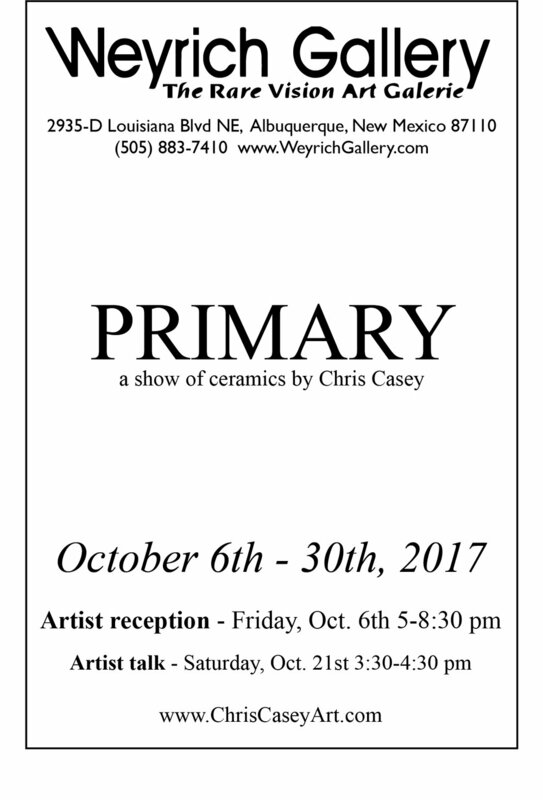 Chris Casey artist statement, "My pottery is adorned with lines that explore the liminal zone between the concrete and the abstract. These designs are improvised and play to our pattern seeking brains. I'm focused on movement and composition by drawing lines in space." Your purchases support Harwood’s free community arts education, outreach and professional development programs – multifaceted, immersive offerings shaped by and for participants of all ages, backgrounds and perspectives. All current members, participating artists and their guests are invited to get a sneak peek of the exhibition. Give us a call (505-242-6367) to make sure that your membership is up to date. A collaborative exhibition featuring emerging and established New Mexico artists united by the medium of clay and the diversity and versatility of ceramics. Opening Reception: Friday June 1, 5:00-9:00 p.m. Closing Reception: Friday June 29, 5:00-9:00 p.m.
31 Days - A Balancing Act is an exhibition featuring six mixed media pieces that were made as a Thing-A-Day (Fun-A-Day) project. The idea is to do a certain thing everyday for a month and then present it at the end. For my Thing-A-Day, I chose to make five pieces where I used a new medium each day. Join us in the gardens for the 3rd Annual Winter Sale! Featuring guest artists Chris Casey, Drita Choy, Niya Lee, Eso Robinson, and Sophia Torres, along with new local wood ash glazed functional wares by Jane! This will be a group show with 13 local Albuquerque ceramic artists. We'll have a whole range of styles and types of work from pottery to sculpture! Chris Casey's grandmother Eloise Lindeborg would have been 100 years old this month. Her pieces in this show are representational and abstract works from the late 1930s through the mid 1960s, much of it produced in Las Vegas, NM. Chris's abstract works span the mediums of pottery, sculpture and drawing. He was born in Las Vegas, NM, and now lives and works in Albuquerque, NM. Sign up to be notified when I'm in shows or have new work for sale.